As the New Year approaches, everyone is thinking about living a healthier lifestyle and exercising more. I’ve talked to so many people that have great new plans and ideas of how to eat healthier and make smarter choices in the upcoming New Year. I’d like to do the same and have been making a list of things I can do and swaps I can make so that our everyday meals and snacks are smarterchoices. One thing I’d like to change in how I cook for our family is how much oil I use in recipes. I’m super heavy handed with the olive oil, and even though it’s healthy, too much of anything isn’t good for you. Another thing I want to change is to serve more fruits and vegetables at breakfast and dinner. Eating a wider variety of fruits and vegetables daily is something my whole family will benefit from. The main change though I’d like to make is to have better snack choices on hand in my fridge. One of our favorite go-to snacks is fresh fruit and cheese. My kids have inherited the same apple addiction my husband and I have, and I love it. I’ve also recently found Weight Watchers® International cheese at my local Publix. I absolutely love snacking on cheese, especially in the afternoon before dinner. It’s a great protein packed appetizer and a way to get a little more calcium in my daily diet. Weight Watchers cheese is not only a smart choice, but tastes great too! I really couldn’t tell the different between the taste of the regular string cheese I usually buy and the Weight Watchers brand. Weight Watchers is so confident you’ll love Weight Watchers cheese, they’re offering a money back guarantee. That’s Great Taste, GuaranCheesed! Weight Watchers has string cheese, and other cheese varieties that are the perfect choice for snacking and all your creative recipes when trying to maintain a healthy lifestyle. The cheese is made from from low-fat milk making it a smart choice you can feel good about. 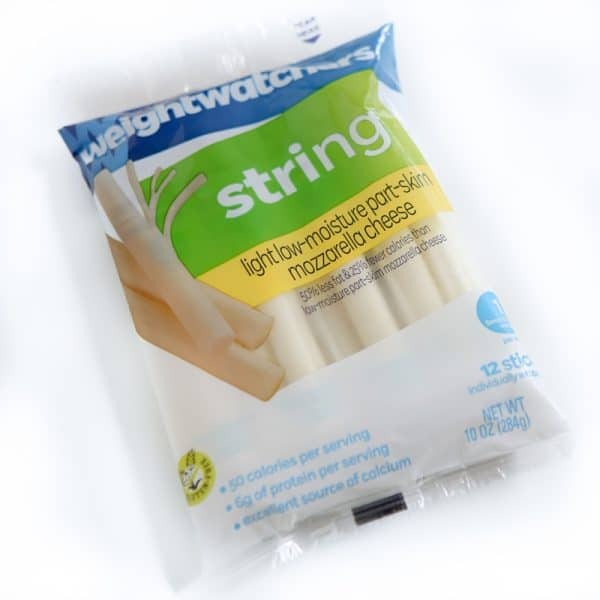 All the string cheese and cheese sticks from Weight Watchers are also individually wrapped to offer portion control and are a great snack anytime of day. And best of all they are just 1-2 SmartPoints® per serving. In addition to the string cheese and sticks, they also have singles, shreds and spreads. Weight Watchers string cheese is great for snacking, but you can also use it as an ingredient! One of my favorite things to do with string cheese is to make cheese sticks. 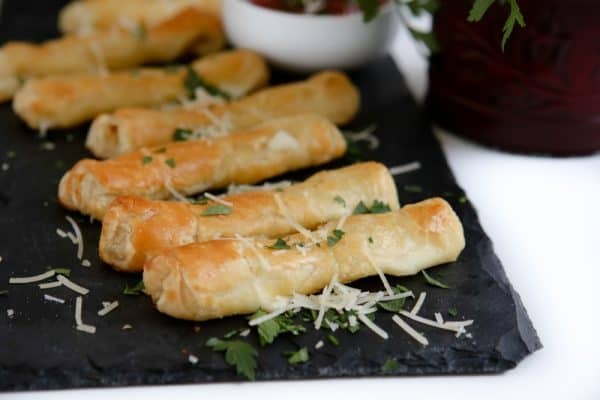 Here I have created a smarter baked cheese stick recipe that uses puff pastry. 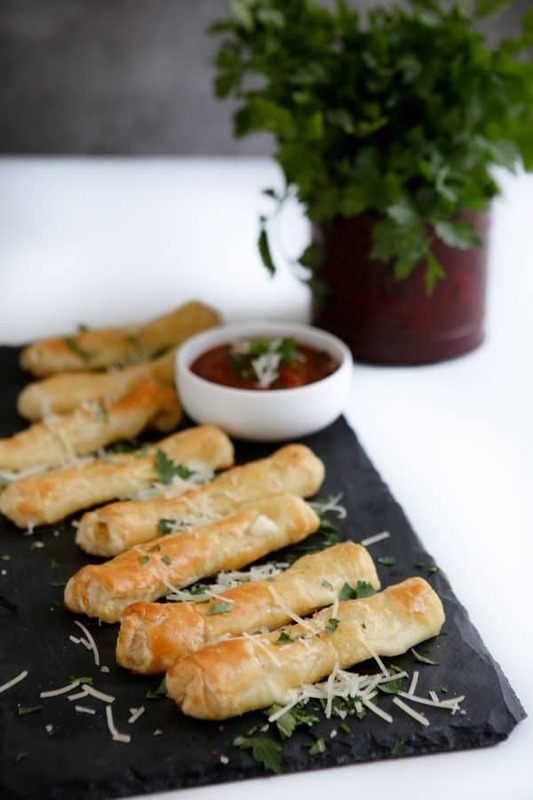 This recipe has a thin puff pastry stretched across the cheese stick. You can use a larger piece of dough to make a crisper mozzarella stick, but then you have more calories, so I take one sheet of puff pastry and roll it out to 12″x 91/2″ and cut it into 12 even rectangles. To get the dough to wrap around the sheet of puff pastry, you must roll out the dough a little more so that it wraps around and will seal. After you have it sealed around the cheese, place it seam side down on a parchment paper lined baking sheet. After all the mozzarella sticks have been placed on the baking sheet, brush with an egg wash. You then bake at 400° for about 15 minutes, or until golden brown. After they’ve baked, some of the cheese will leak out, but that’s okay, we’re trying to save calories anyway! To learn more about the Great Taste GuaranCheesed program go to TakeTheGreatTasteChallenge.com. Heat oven to 400°F. Whisk egg and water together in a small bowl. Unfold pastry sheet on a lightly floured surface. Roll out to 12 x 91/2 inches. Cut in 12 even rectangles. 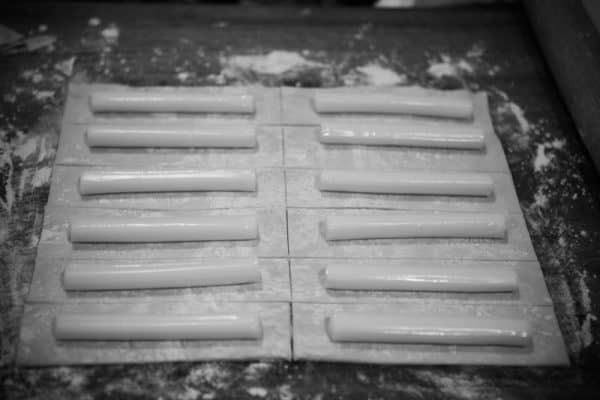 Place 1 cheese stick on a long edge of each pastry rectangle. You may need to use the cheese as a rolling pin and make the dough a little larger to wrap around the cheese stick. Roll pastry around cheese and then press seams and pinch to seal. Place the rolls, seam-side down, onto a baking sheet lined with parchment. Brush the tops with the egg mixture. Prick the tops with a fork. Bake for 15 minutes or until golden brown. Remove from baking sheet and let cool on cooling rack for 10 minutes. Heat sauce and serve for dipping. 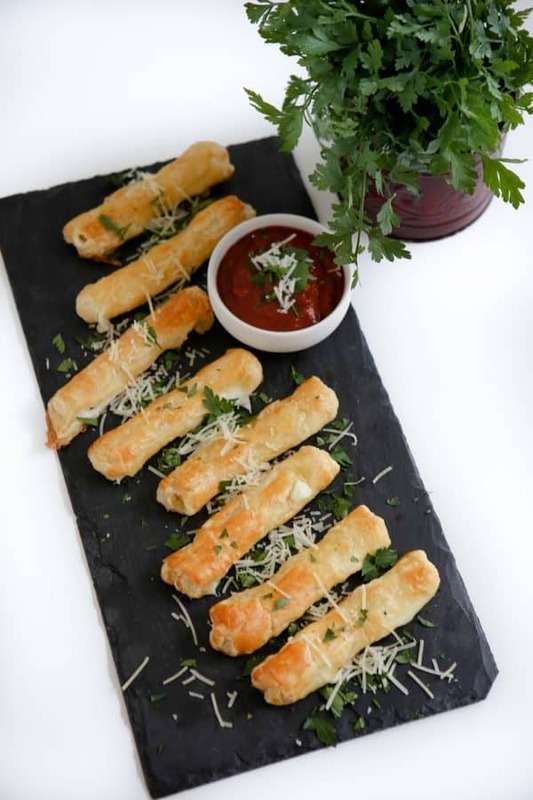 Garnish cheese sticks with grated parmesan and fresh Italian parsley. Tip: To make crispier, breeder mozzarella sticks, use twice the amount of dough and cut each sheet of pastry into 6 equal sized rectangles. This recipe uses a smaller amount of dough to save on calories. Love that these are baked and not fried!